« Join Us on October 4, 2014!!! Was working up a tune for The Montereys and grabbed an erroneous lyric off a music web site. I suspected that the word-in-question was ‘know’, but, alas, the lyric read, ‘lose’. So that’s how I recorded it! 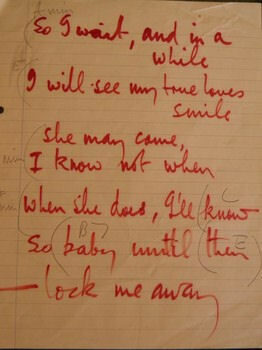 Now, I discover (in his own handwriting) that Paul McCartney wrote, ‘know’!!! And that makes much more sense. Push the play button, below, to hear our version.